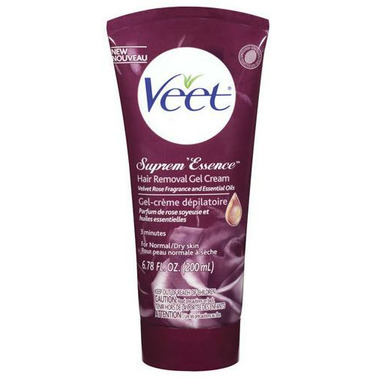 Veet SUPREM' ESSENCE Hair Removal Gel Cream is incredibly effective on course leg hair yet gentle enough for me to also use on my face. I am very impressed that I didn't need to purchase two separate products! Good texture and scent, removes hair pretty well. It does burn on areas with sensitive skin, and DO NOT RUB IN. Just spread a layer and leave it for 3-6 minutes and you're good. I prefer it over other hair removal creams but it's not spectacular. an EXCELLENT product. removes the hair, doesn't irritate the skin, and smells nice. i still moisturized after rinsing the skin, but i think you may not have to. all it needs is something like a stylus to scrape the cream off. (then you don't rub it in). I haven't shaved in almost a decade. No more cuts, nicks or razor burn PLUS your legs stay smoother, longer. I use this once a week. I put it on before I shower. Then I brush my teeth which takes 3 minutes. By the time I brush my teeth the cream is ready to remove. I do use a washcloth in the shower to remove the cream. It is the only way to remove the hair properly but it works like a hot damn! Your skin should love this !